Last month, the world marveled over photos of a "lost" tribe in Brazil shooting arrows at a passing plane. Who were these people covered in black, red and orange paint? And how could they be completely ignorant of modern society? Now, however, according to a recent article in the British newspaper The Guardian, the Brazilian official who took the photos, José Carlos dos Reis Meirelles, admitted that he has been studying the group for more than two decades and that the "chance" meeting was no accident. "When we think we might have found an isolated tribe, a sertanista like me walks in the forest for two or three years to gather evidence and we mark it in our [global positioning system]. We then map the territory the Indians occupy and we draw that protected territory without making contact with them. And finally we set up a small outpost where we can monitor their protection," Meirelles told Al-Jazeera, according to the Guardian. The Brazilian government released the photos, which were shot in late April and early May, at the end of last month. Taken from a plane passing overhead, the photos show several nearly-naked Indians painted head to toe and brandishing bows and arrows. In September 2007, scientists spotted members of what they believed to be the Mascho Piro tribe in Peru while looking for evidence of illegal logging. Survival International, the indigenous rights group that pushed the photos to media outlets, disputes the article's characterization of the photos and the tribe as a hoax. "The [Guardian] article claims to 'reveal' that the tribe photographed was neither 'lost' nor 'unknown.' The reality is that neither Survival nor the Brazilian government claimed they were," Survival International's director Stephen Corry said Tuesday in a statement. "When Survival published the photos, we quoted [Meirelles], the Brazilian official who released them, saying, 'We did the overflight to show their houses, to show they are there…' As Mr Meirelles said when the Brazilian government released the photos, the Indians' territory has been monitored for 20 years." "'What is, and remains, true, is that so far as is known these Indians have no peaceful contact with outsiders," Corry continued. "The publication of the pictures has pushed the Peruvian government into investigating their plight, a huge step forward given that just a few months ago Peru's President publicly questioned whether uncontacted Indians exist at all." According to anthropologists and activists, instead of being "lost," the group is one of many in the Amazon that have chosen isolation as development encroaches upon the land that Indians have called home for centuries. This wasn't the first time that a so-called "lost tribe" was spotted from the air. In September 2007, scientists spotted members of what they believed to be the Mascho Piro tribe in Peru while looking for evidence of illegal logging. 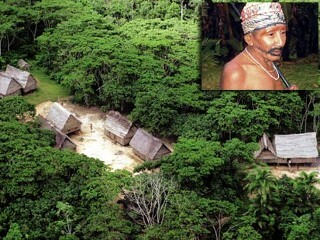 Survival International estimates that there are more than 100 uncontacted groups in the world and about 60 in the Amazon. Others argue that there's no definable number. "That's a number pulled out of almost thin air," said Beth Conklin, an associate professor of anthropology at Vanderbilt University who works with the Wari' group in western Brazil. "There certainly are a number of groups in several specific areas. No one knows how many people, how many different groups there are." While the term "uncontacted" is often used to describe these Amazonian tribes, experts say that these groups are fully aware of the outside world, but choose to opt out of it. The Nahua, a once isolated tribe in Peru, were first contacted in the 1980s when Shell begin looking for oil on the tribe's land. Up to half the population died of disease, according to Survival International. "The uncontacted people who still remain in the world today are people who have at some point in the past made the conscious decision to avoid direct relationships with the outside world," Conklin said. "It's very common that part of [a] group will decide to flee deeper in the forest to avoid the disease and violence that comes with contacts from outsiders." Since Spanish conquistadors arrived in the New World, indigenous people have experienced death by either violence or disease that the group had never been exposed to before, anthropologists said. "When they get hit, the entire group gets sick," Conklin said. "There's wisdom in the decisions that these groups [make] to avoid contact with outsiders." But not all groups have chosen to exclude themselves. "Over the centuries, some of those people were drawn out or contacted with the rubber boom and the search for gold," cultural anthropologist Alaka Wali said from Contamana, Peru, a remote community near the Brazilian border where the group was seen. "Some chose to settle down on part of the rivers and forest where they were in contact with Western society as it was developing. But other people in the Amazon didn't want anything to do with Western society. The people who, like the ones in the news today, are people who chose to retreat into the depths of the forest precisely because they don't want to be in touch with other cultures or with Western society." In the past 30 years, the settlements of the Matses has become more permanent. Like many so-called "uncontacted" groups, the Matses fell in and out of contact with Western civilization for years. What finally lured them away from their seminomadic lifestyle and out of the jungle was a missionary group. As the director of the center for cultural understanding and change at Chicago's Field Museum, Wali, who eschews the term tribe because of the primitive images it conjures up, studies the effect that modernization has on indigenous communities in Peru and Ecuador. In addition to bringing disease to the Amazon, contact with Western society has also long been detrimental to these groups culturally, Wali said. "Even if the people themselves were not out and out killed as a result, the cultural fabric is torn apart," Wali said. "It's been very hard for the cultures to maintain some sense of autonomy or distinctiveness. … A lot of indigenous people are aware of the issues and in touch with national society and have struggled to be part of national society, but also to maintain their own identity and culture autonomy." A prime example of a group that has transitioned is the Matses, a community Wali has worked with extensively that is on the Peru-Brazil border. The Matses came out of isolation only 40 years ago. Though many of the world's uncontacted groups live in the Amazon, experts say there are remote groups in other parts of the world. The Sentinelese, a group that lives on the Andaman Islands, is famously isolationist. Like many "uncontacted" groups, the Matses fell in and out of contact with Western civilization for years. What finally lured them away from their seminomadic lifestyle and out of the jungle was a missionary group that started schools for their children in the 1960s. "They tell us it's a complicated history. They've been in and out of contact over the centuries. It's not like they were uncontacted and didn't know anything" about Western culture, she said. Similarly, the Matses are still in contact with groups that are linguistically related, but choose to remain remote. "They tell us, 'They don't want to come and settle down like we did,'" she said. In recent years, isolated groups, particularly in Peru, have faced danger from a new kind of explorer: in this case, companies looking for oil and timber. 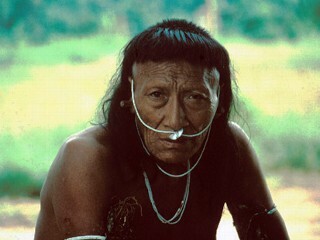 Kemperi is a powerful Huaorani shaman, known for his ability to capture the powers of the Jaguar. He has a history of interaction with the uncontacted groups in this part of Ecuador, mostly by trading for feathers and axes. He is renowned throughout the Huaorani for his past exploits as a warrior. Photographer David Gilbert Lived with the Huaorani in 2006. That's what David Gilbert found in 2006, when the Fulbright scholar spent a year living with and photographing the Huaorani, a remote group that lives in "la zona intangible," a government-protected area for indigenous groups, in Ecuador, alongside three uncontacted groups. 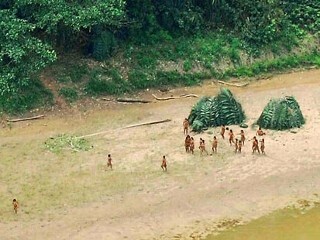 Gilbert saw members of two uncontacted tribes while he lived with the Huaorani: Tagaeri, a family clan related to the Huaorani, and the Taromenani. Hemmed in by oil and logging companies, both of which are illegal in the protected zone, the tribes had begun fighting over ever-diminishing resources, Gilbert said. "These groups are aware enough of the general situation of the Huaorani," Gilbert said by phone from Indonesia, where he is working with the Asia Foundation documenting indigenous groups and illegal logging. "By coming across dead bodies and even talking to the Huaorani about their experiences — they do sometimes have trading meetings — the risk of coming out to the world just isn't worth it. And they know enough to say, 'We don't want to get involved.' And they can hopefully avoid polio and these wars that break out in the forest with people shooting at each other with shotguns." Gilbert's guide through the experience was Penti Baihua, the Spanish-speaking leader of the Huao village Bameno. "He was my guardian and spokesman and even bodyguard sometimes with other Huaranis down there," Gilbert said of Baihua. "He really has been fighting a small-scale war against illegal loggers. … Through his point of view the outside of world can offer him some protection and can help him in his struggle against illegal loggers." According to Survival International, within eight years of a gold rush on their land during the 1890s, 20 percent of the Yanomami tribe died. The challenge that the Huaorani face — losing land to development — is a common one, according to Survival International. "The main [challenge] to tribal peoples is loss of their land," spokeswoman Miriam Ross said. "Tribal people's lives are intricately wound up with the land for hunting, gathering [and] fishing, but also … their culture." Not everyone is convinced that these "lost tribes" exist, however. In the Amazon, oil and logging companies have often called into question the existence of these tribes because very few have been seen. An executive at a government-run oil company in Peru reportedly compared rumors of their existence to the Loch Ness monster. But for activist groups, the most recent photos out of Brazil are proof. "Photos like what we're seeing today are evidence that they do exist," Ross said. "[Companies] really have to acknowledge that these people are there and stay off their land and leave them alone." "These people are living perfectly well," she said. "They're not asking us to come in and rescue them."